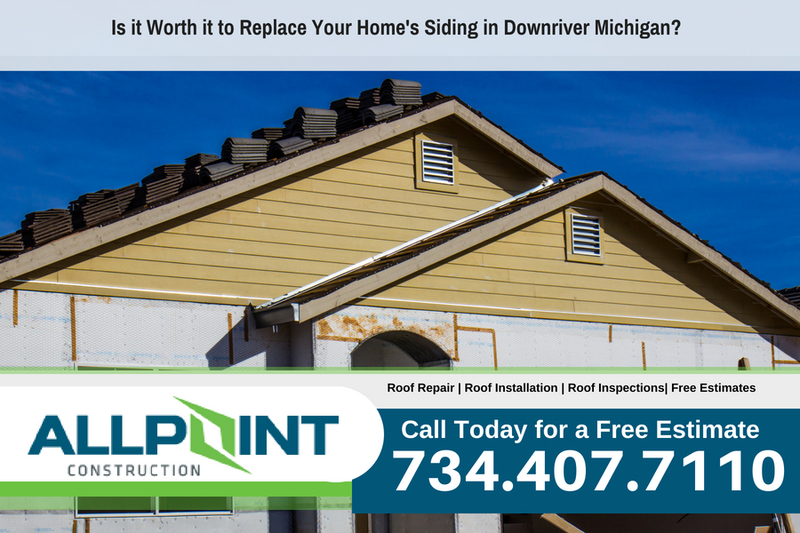 Is it Worth it to Replace Your Home's Siding in Downriver Michigan? Is it Worth it to Replace Your Home’s Siding in Downriver Michigan? One of the most important aspects of a house is the siding and how it looks and performs. Since the very first design, exterior siding has been a major component of constructing a house. When it comes to aesthetics and curb appeal, the exterior of the house is crucial. This is what everyone sees when they pass by and it’s the first impression newcomers have of your house. If you are like me however, you know that looks are not everything. Providing a good view is not the only thing your siding is supplying; shelter from nature’s elements are a key reason to invest in better siding in Downriver Michigan. Modern homes in Downriver Michigan have efficient and durable siding that lasts a long time, but eventually it will degrade and need to be replaced. For homes that have James Hardie siding installed that may not happen for many years however. Thatch, wood, stone, plastic, imitation brick, metal, masonry, composites are all used for siding and provide different benefits. Which one is the best for your Downriver Michigan home? If you are looking to replace the siding on your house, a little bit of research needs to be done. This article provides information on the big decisions you need to investigate before beginning a new siding project in Downriver Michigan. In most cases there will be visual cues that your siding is beginning to fail. Some key signs are moisture and mold growing on part of the house, cracks starting to form in siding boards, gaps between the boards, wood starting to rot away, slight warping of the wood so the siding no longer lays flat, or other deformations that cause an abnormal appearance. It is recommended to do a thorough inspection around the house. Other clues that your siding is degrading may be an increase in your heating or cooling bill. You can always have a siding contractor come out and make an inspection on your home. There are several decisions that depend on your location and the climates you typically experience. One thing to keep in mind is the aesthetics of the neighborhood. Choosing a siding material and color that matches the neighborhood will prevent your property value from dropping. Siding materials varies in cost depending on looks, durability, and effectiveness. Although a material may look nice, it is best to consult a professional to assess the benefits and drawbacks of each material you may want to use. It may seem that the cost of re-siding a house is steep, but it’s worth considering the money that can be saved from good thermal insulation. Siding can go a long way towards insulating your house and lowering the cost of maintaining a comfortable living temperature in the home. Re-siding a house can seal any gaps that let out the precious heat during cold winters or let in the dreaded heat on those hot summer days. If you spend a lot of money on heating or cooling your house every year, it is worth looking at siding options that are designed to provide maximum insulation. How does this effect my property value? Thermal insulation is not the only cost saving aspect of re-siding a house. Prospectors know the importance of siding and are not apt to buy a house that needs new siding. Re-siding a house increases aesthetic appeal, shows good house maintenance, and increases the lifetime of a house. When reselling a house, it is typical to regain more than half of the cost spent on the siding project in Downriver Michigan. This proves to be a valuable way to invest in home improvement that benefits you for years to come. Whether you are happy with your house or are trying to improve it, siding is of great importance. Caring for a home starts with the foundations that hold it together. Siding provides shelter, a great view, and insulation. The benefits of re-siding a house increase over time, so it is worth looking into now before you lose out. When taking on a project as big as this, it is best to have the aid of professionals. The team at All Point Construction are trained to help you find your way around your next home improvement and offers free consultations on siding projects in Downriver Michigan. Call All Point Construction today at 734-407-7110 for more information.